Microsoft has made huge changes to the Windows 7 taskbar. 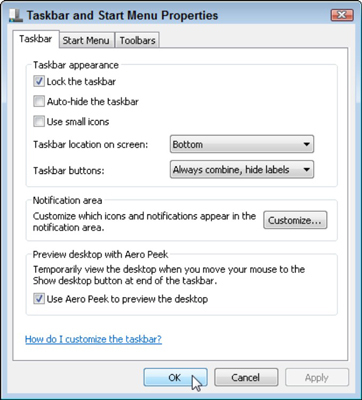 It also has made it possible for you to customize many of the options and settings on the Windows 7 taskbar. You can move icons where you want, change the way the bar behaves, add toolbars, and pin any icon you want on it. The taskbar comes preloaded with three icons next to the Start menu: Internet Explorer, Windows Explorer, and Media Player. To add more programs to the taskbar, just drag and drop a program’s icon directly onto the taskbar. All your taskbar icons are movable, so feel free to rearrange them in to any order you want. You can also right-click the icon on the Start Menu and choose Pin to Taskbar from the pop-up menu. For even more customization, right-click a blank part of the taskbar, and choose Properties. The Taskbar and Start Menu Properties window appears. The options in this dialog box let you control the way the Windows 7 taskbar behaves. you want before you lock it. Use Small Icons This shrinks the taskbar and its icons to half-height. Taskbar Location On Screen Choose any of the four edges of the screen. protect the taskbar from overcrowding. area (down by the clock). Feel free to experiment with the taskbar until it looks right to you. After you’ve changed an option, see the changes immediately by clicking the Apply button. Don’t like the change? Change the setting and click Apply again to undo the damage. Some of the taskbar options won’t work if the task bar is locked.